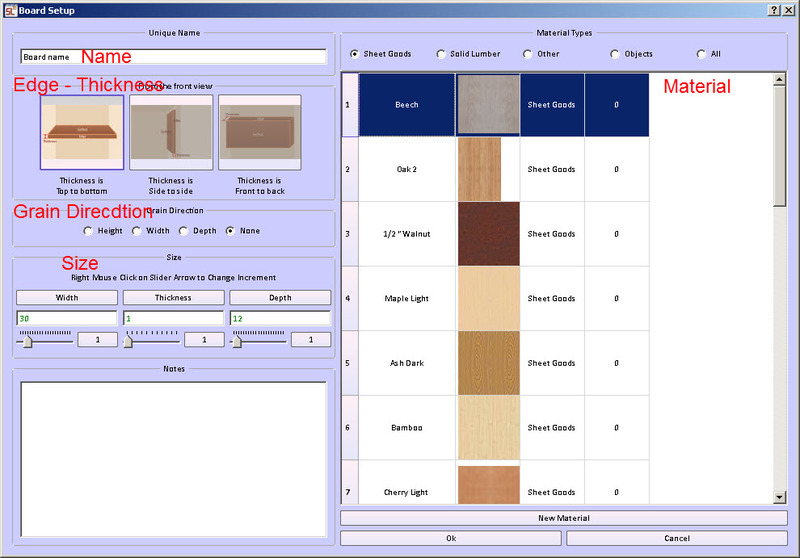 Woodworking Design Software uses virtual boards to achieve designs. 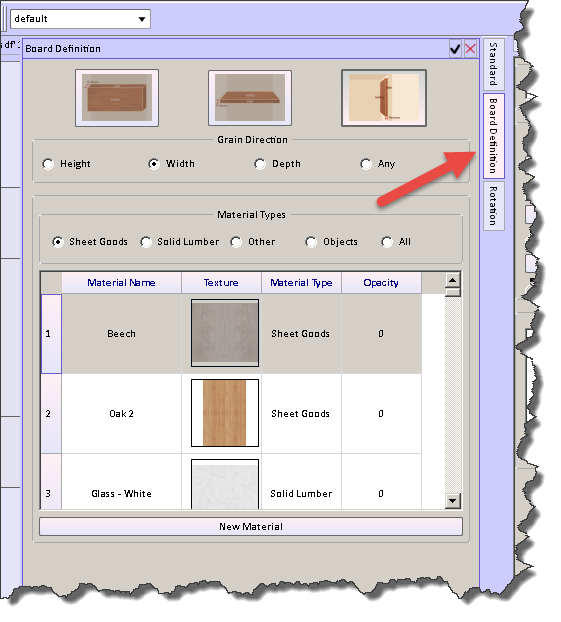 Lesson: Using the tools of SketchList 3D woodworking design software to create boards. You will learn the five elements of a board [according to SketchList 3D] and how to enter and change them. You will see what is required of a board by the optimizer in order to create optimized layout diagrams. The lesson includes tips and tricks for working with boards. Summary. This is as basic as SketchList 3D gets. You must by repetition and practice master this lesson. Learning Objectives: Creating and inserting boards in your design. Know the five elements of a board and what they do. Leaning about how different materials can be used. Learning Resources Definition: A board is any three dimensional object consisting of a material.Orientation – one of three options setting which edges of the board represents the board’s thickness. It is used by the optimizer. Activities Start SketchList 3D, create a project, and insert boards into the assesmbly.Use the new board form to define the board.Make a box to learn the three different orientations a board may have. One of the unique aspects of SketchList 3D as woodworking design software is the way it uses three dimensional virtual boards to achieve design. A virtual board is any three dimensional object. Most typically woodworkers use materials some species of wood – solid lumber or plywood. However with SketchList 3D a board can easily be any material. You may have need in your design to use stone for a counter top. You may want to use glass for door fronts and or metal for hardware or special design options. In SketchList 3D boards have attributes. Boards have and display textures and grain images. Boards can be rotated 360° around a point in three directions. Board attributes will be covered in a later lesson. This lesson focuses on creating and editing a new board. Boards exist as objects in “containers”. A container can be an assembly, door, drawer, or piece of hardware. You insert a new board into a container by dragging the new board icon into the container in which you want the board to exist. If there is more than one possible destination for the board a form will open. 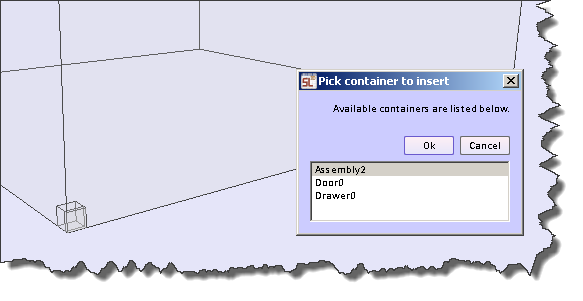 Select the container in which you want to place the board. A new board form will open. The new board form contains five elements that define the board. These are necessary to properly visually represent the board in your design, to accurately layout the board in your optimized material layout report, and to present information about the board to the parts list/cutting list reports. there are five things that define a board to SketchList 3D. Name. This board identifier appears in all reports. One tip is to name the board in a way that will sort in such a way that similar boards are gathered together and sorted reports. For example side – left and side – right or better selection of board names then left side and right side. The edge which represents the thickness of the board. The Optimizer needs to know which dimension of the board matches against the thickness of the material to be laid out properly. Pick one of the images represented by the icon. The first image represents a board like a shelf. The second image represents a board like a side or divider. Grain direction. The Optimizer requires a grain direction to be specified to ensure proper layout. If not using or concerned about grain direction you can specify none. Size board – enter the size of want to change. You will notice that one of the dimensions is labeled thickness. These change depending upon the icon you selected above. Material – type and species. Edit or change board characteristics. There may be times when you choose to change some aspect of that definition of a board. To do this select the board and click the board definition tab to the right of the SketchList main form. A form will open and you can change the edge with thickness, grain direction, or material type. Changing size and location covered in other lessons. Experiment with inserting new boards into containers. Do at least three boards in an assembly – one of each direction.